U7 is set up for monostable operation. Initially (before the sweep is triggered) the discharge transistor inside the 555 has pulled pins 6 and 7 to -5V and fully discharged capacitor Cs. When U7 is triggered via pin 2, the discharge transistor shuts off and Cs begins to charge. In most of the 555 circuits you will see, this charging current comes from a resistor connected to the positive supply. In this case, though, it is the voltage at pin 6 that is driving the sweep across the screen of the scope. A resistor charging a capacitor creates a non-linear change in voltage with time and thus would result in a distorted sweep. Objects on the left side of the screen would be stretched and ones on the right compressed. So instead of a resistor, Cs is charged with a constant current source consisting of a 2N3906 transistor, a TL431 shunt regulator (which acts like a 2.5V zener), a diode and some resistors. The TL431, the diode and the 4.7K resistor hold the base of the 2N3906 2.5V plus one diode drop (.6V) lower than the +9V supply. The collector current charging Cs (plus a tiny bit of base current) comes from the emitter of the transistor and thus from the +9V supply through Rsense. The voltage at the emitter is pulled down until it is equal to the base voltage plus the one diode drop of the transistor base-emitter junction. So the emitter voltage ends up at 2.5V below the +9V supply and it stays at that voltage no matter what the collector voltage may be. 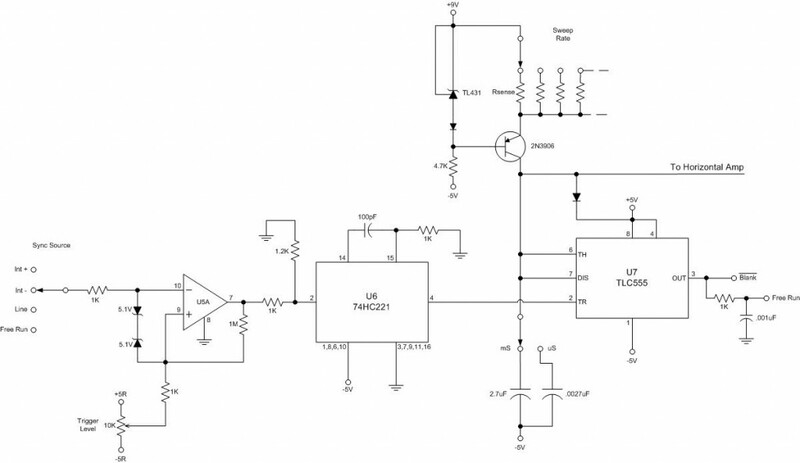 The emitter current is thus 2.5V÷Rsense and the collector current is very nearly the same. For example, if Rsense is 1K, IC is 2.5mA. The switch selects different values of resistors and thus different sweep rates. This circuit works very well over at least 3 decades of sweep rates. It could accommodate more, but it is hard to find switches with more than 12 positions, so another switch is included to select two values of capacitor. I left the resistors off the board because they are easy to wire to the switches and it cuts way down on the number of wires needed. As Cs charges, the voltage delivered to the horizontal amplifier rises, and the dot moves to the right across the screen of the CRT. The comparator inside the 555 detects when the voltage on pin 6 reaches the threshold value (1.7V), and turns the discharge transistor back on. This pulls the voltage back down to -5V and the dot returns to the left hand side of the CRT screen. The 555 then waits for another trigger and the cycle repeats. U5A is a LM319 comparator. When it’s positive input is higher than the negative input, the output flips high and vice versa. The output is an open collector NPN transistor. The trigger level pot adjusts the level of the +input voltage to U5A and the incoming signal provides the negative input. The two 1N4148 diodes protect the inputs. The Sync Source switch selects the source of the sync signal. It can come from the vertical amplifiers, from an external source, from the AC line frequency or from the 555 output. When the sync input signal drops lower than the trigger level setting, the output of U5A goes high which triggers U6, a 74HC221 one shot. The HC221 is powered in an unusual way in this circuit. Normally, logic IC’s are powered from +5Volts (Vcc) and ground. In this case we need to work with negative voltages, so the HC221’s Vcc pin goes to ground and the pin that is normally grounded goes to -5Volts. This works fine so long as the inputs to the HC221 do not exceed the range 0 to -5V. Triggering the HC221 causes it’s QNOT output, pin 4, to drop from 0 to -5V and then return to 0 after 100 nS. This signal is coupled to pin 2 of the 555, causing it to trigger. OK, why do you need the 221 at all? Couldn’t you just cap couple the output of U5A to pin 2 of the 555? Well, that was my first thought, but it turns out that if you make the coupling cap small enough that the pulse has decayed by the next trigger cycle (at fast sweep speeds), then it does not reliably trigger the 555 due to the limited slew rate of the comparator output. The 221 outputs a hot pulse, is DC coupled and eliminates the problem. The horizontal amplifier is nearly identical to the vertical amp except that it has one less stage and that it’s gain is controlled only by a trimpot on the board. Once you set the gain so that the time per division is correct on one sweep speed it is correct on all ranges within a few percent. The output of the horizontal amp drives the x axis deflection plates of the CRT.